Earlier this month the local media reported that, while crime rates dropped in most big Orange County cities, Costa Mesa was one of two - the other being Huntington Beach - that showed a rise in violent crime. Costa Mesa's numbers jumped a whopping 35.7%! You can read the Orange County Register article on this subject HERE. When I saw the title, "Explaining rise in violent crime", I expected Chief Shawkey's words to provide me with some comfort. They didn't. I hoped to come away from his commentary less tense about the crime situation in our city. I didn't. In his second paragraph the chief said he felt compelled to "provide some clarity to the city's true crime picture". He didn't. He starts by telling us that robberies decreased by 37% between 2006 and 2007. That, of course, is great news. He goes on to tell us that in 2008 it bounced back up to almost the same level as 2006, which - in his words - "was consistent with reported robberies for the past several years, accounting for a large part of the increase in violent crime." Sorry, chief, but that doesn't make me feel safer. Then he tells us that his police department - my police department - has been screwing up when reporting certain offenses - they just didn't report them! Yikes! He continues to tell us that his officers have now been trained, so all those crimes are now being reported and that is the reason for the increase in violent crimes. Swell. I still don't feel safer, although I do feel nervous about who's counting what at the CMPD. NOT AS BAD AS SANTA ANA? - SWELL! Then, apparently trying to finally make us feel better, he gives us a little chart comparing crime rates in other Orange County cities, illustrating that Costa Mesa is better than places like Santa Ana, Anaheim, Garden Grove and shares the same statistics with Fullerton. He then tells us that, "Even though those cities reported a reduction in their number of violent crimes, their violent crime rates are equal to, or greater than, ours." What?! C'mon, chief - is that supposed to make me feel safer? It doesn't. He wraps it up by telling us that car thefts are down 25%, sexual assaults are down, gang-related arrests are up 30%, DUI-related arrests are high and traffic-related deaths are down. All this is good information. I understand the kind of pressure the chief must be under these days. The city is in the midst of perhaps the greatest financial crisis in it's history with staff cuts almost guaranteed. Rising crime statistics will make it difficult for him and the other city leaders to deal with the police union as they attempt to negotiate mitigation of their current contracts to help the city balance it's budget. I'm a great supporter of law enforcement. I understand and appreciate the job those brave men and women do for us every single day. I do have an understanding of the kind of person it takes to run a police department effectively - I know several strong, effective law enforcement leaders personally. One of the characteristics a law enforcement leader needs is the ability to help the residents to feel safe in the time of stress and uncertainty. In my opinion, Chief Shawkey failed to do it with his commentary. How does a nice, hot, juicy hamburger sound to you right now? No? How about a trio of carnitas sliders? With fries or onion rings? How about a delicious milk shake? Yum! Well, neighbors, I have a couple opportunities for you to satisfy those cravings. 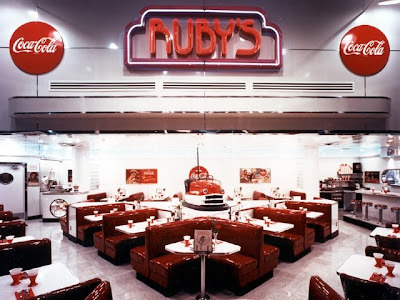 First, Ruby's Diner at 428 East 17th Street in Costa Mesa is hosting a fund raiser for the Costa Mesa Library Foundation. This is week-long event, beginning this Friday, May 15th through next Friday, May 22nd. The Library Foundation will receive 20% of the value of all food and non-alcoholic beverages served between 4 p.m. and 9 p.m. on those dates when presented with the appropriate flier (below). You must bring the flier with you and may not distribute fliers in the restaurant. This is a great event for a very worthy cause. Second, Ruby's Diner at South Coast Plaza West (on the Bear Street side below the bridge) is hosting a fund raiser for the Estancia High School Australia Sister City Education Exchange Program on Monday, May 18th. This one-day event will provide 20% of all food and non-alcoholic beverage sales betweem 4-9 p.m. when accompanied by the appropriate flier. You must turn in your flier with your meal and may not distribute fliers at the event. TRY MY FAVORITE DESSERT, TOO! Both of these wonderful events present a great opportunity to support worthy Costa Mesa programs and have some terrific food at the same time. Whatever you have, try my favorite dessert, too. Ask your perky Ruby's server for a slice of their apple pie, heated with a slice of cheddar cheese melted on top! Yum! 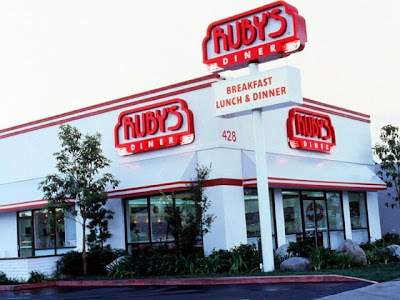 We want to thank the great folks at Ruby's for their continuing support of events like these in Costa Mesa. The local managers work very hard at being good corporate neighbors and these two events are perfect examples of their citizenship. Give my best to Javier at South Coast Plaza and/or Phil at the 17th Street store and thank them for their participation. At their meeting Monday night the Costa Mesa Planning Commission gave approval to In-N-Out Burger to build a new restaurant in town at the location of the former Kaplan's Deli, on Harbor Blvd. at the 405 Freeway. You can read Alan Blank's article in the Daily Pilot HERE. Even though the plan was approved, everything was not all rosy for the developer. Chairman Jim Righeimer and his tag-team partner, Steve Mensinger, demonstrated one more time just what developers in our city will face as they bring projects forward. The project was approved - without the signage requested by the applicant - and it included a condition of approval that the applicant didn't like. I can't blame them. It dealt with the need to replace a chain link fence with somet hing spiffier - like a block wall with wrought iron, for example - and also required them to work out an arrangement with the city and Cal Trans as to just who would be responsible for the maintenance of roughly 1500 square feet of landscaping. Depending on how those negotiations go, the costs to the applicant could be very significant. Both Righeimer and Mensinger assumed their bully demeanor and made it clear that because they, as developers, had done such projects in the past, they expected the applicant to follow their demands. Rookie commissioner Colin McCarthy, a real estate lawyer, twice tried to get Riggy and Mensinger to back off, and was joined by Vice Chair Jim Fisler - to no avail. They dug in their heels and refused to modify their demands. The motion approving the project - with the contested condition of approval - eventually passed unanimously. I don't like what I see in Righeimer and Mensinger on the Planning Commission dais. 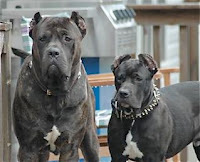 They demonstrate impatience with applicants and Riggy short-cuts procedures. Last night, for example, he failed to give the applicant a final chance to address the contested issues before calling for the vote. 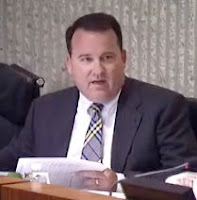 He's making up the rules as he goes along, which is certainly a change in atmosphere from other recent Planning Commissions, who followed the rules and conducted hearings with professionalism, decorum and respect. "EX PARTE"? WHAT'S THAT ALL ABOUT? Another thing that I find curious is Righeimer's question of his fellow commissioners inquiring if they had had any "ex parte communications" with the parties to the items before them, as though that's a problem. The term "ex parte" is a legal term derived from the Latin and means "By or for one party". I'm not sure what is driving this line of inquiry by Righeimer, but the implication that having private conversations with developers and applicants before the commission is somehow out of line is misleading at best and certainly should offend his fellow commissioners and their predecessors. Every good commissioner in recent memory has considered it his or her job to do just that - visit sites and talk with the principals of the projects to get a clear understanding of the issues. I don't know if the applicants will appeal the project to get the wall and landscaping demands sorted out and to re-address the sign issue, but I wouldn't be at all surprised if they do. Riggy's playing fast and loose with the rules and we're going to see many of these kinds of situations during his tour as Chairman. The City Council needs to get this resolved in a hurry or they're going to be seeing a lot of appeals of this Planning Commission's rulings. TIMING - it's an interesting word. One of my dictionaries defines the word as follows: "Selection for maximum effect of the precise moment for beginning or doing something." It can be used in many contexts - the timing of Manny Ramirez' swing when he was actually able to play for the Dodgers or the perfectly executed behind-the-back pass from Derek Fisher to Kobe Bryant in the NBA playoffs. However, what brings this word to mind today is the juxtaposition of a few recent events. First, we have our budget crisis, which is impacting everyone and every level of government - federal, state and local. At the state level, the spineless morons we've elected to the Assembly and Senate have, along with our actor /Governor, failed to produce a real balanced budget and what they have produced depends on the approval by the voters of a passel of measures staring them in the face on the May 19th ballot. Then we have the horrendous fires in Santa Barbara, which will apparently still be burning after a week and, at the time I prepare this missive, have destroyed more than 6 dozen homes, damaged many others, displaced tens of thousands of people and have cost still-undetermined millions of dollars to fight. We here at A Bubbling Cauldron are particularly concerned about those fires because we have relatives among those first ordered to evacuate their homes nearly a week ago and who just returned to their home of a half-century this morning to find that the fire - which began literally a stone's-throw away from their location - had nearly circled it over the past five days because of the capricious, shifting winds but left it and others on their street undamaged. The "timing" reference deals with the first news conference our actor/Governor held at the Command Center at the Earl Warren Fairgrounds, with the smoldering hills behind him, in which he made none-to-veiled threats that if his ballot measures failed it would mean laying off many of the brave firefighters who, at that time, had fought the Santa Barbara fires for two days straight. What an opportunistic hack he has turned out to be! Let me be clear about one thing... The brave men and women who, literally, put their lives on the line for us as police officers and fire fighters deserve all the accolades they receive as they go about performing their dangerous duties. There are those in this community who criticize them because they perceive them to be under-worked and overpaid. That's a crock! In any hierarchy there will always be a few people who know how to "work the system", but for the most part I think our public safety employees work hard in dangerous jobs to keep us all safe. I thank them for their dedication. That being said, and even in light of the current fire emergency in Santa Barbara in which members of our fire department are participating and considering the spike in violent crimes in our city, it is my firm belief that the unions for those organizations MUST sit down with the city leaders to try to find a way to help balance our budget with few or no persons laid off. If they don't they then force the city council and senior staff into a corner - layoffs or no budget. 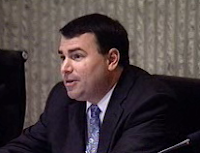 The City Manager has said recently that "we will have a balanced budget by July 1st". WE KNOW YOU'RE BRAVE, BUT ARE YOU WISE? So, to our public safety staff members I say, now is the time to demonstrate that you are not only brave, but wise, too. Now is the time to sit down with the leaders of our city to try to find a way to help balance the budget without members of your organizations being laid off. It's time to recognize that the voters of this city have treated you well during the good times and only want you to try to help through this current crisis by sharing the load with your peers instead of having some of them cast aside. It would be easy for the fire fighters and police to use the current Santa Barbara fire and the recent increase in crime numbers as bargaining chips in this little budget waltz with the city. My question is, do they really want to do that? Or, might they, instead, step up and make a good faith attempt at resolving our budget crisis by taking the high road. I guess we'll see. I know we'll remember.